This post contains affiliate links and by making a purchase through those links I make a small compensation. All thoughts and opinions are my own. I am back with another gift guide to inspire you with your holiday shopping. We have a couple more weeks until Christmas and I am going to be honest, we haven't even started shopping yet! 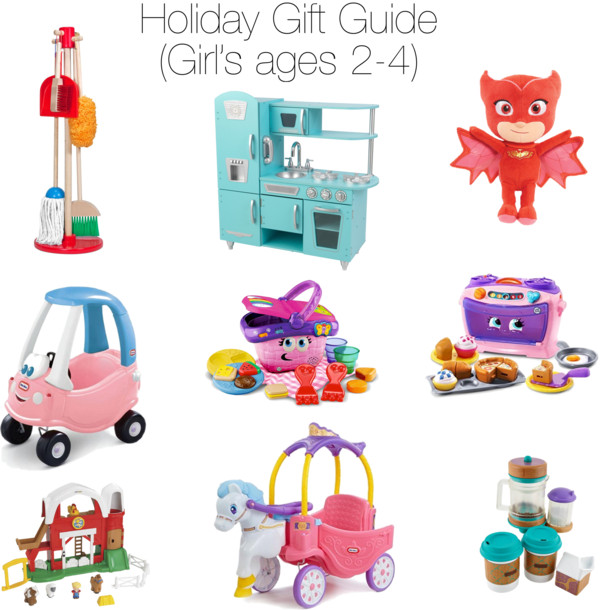 I hope if your behind like we are that this gift guide gives you some ideas for the sweet toddler girl in your life. My daughter loves helping me clean around the house, so why not get her her very own cleaning set? Aurora loves pretending to cook meals for me. I have been on a hunt trying to find a play kitchen for her and her big brothers to play with. I really like this KidKraft one. It comes in all sorts of colors and is very affordable. 3. Owlette Plushy from PJ Masks $19.79 + Free Shipping on orders of $25 or more. Who else's children are obsessed with PJ Masks? I have only ever seen Cat Boy plushies but when I saw Owlette, I knew Aurora would love it! We don't own this...yet, but Aurora got to play with one when we went to Latin's Cider Mill the day after Thanksgiving. She loved it. 6. Number Lovin' Oven (White) by LeapFrog $18.74 + Free Shipping on orders of $25 or more. We have an older version of this oven and the kids play with all the time. They really enjoy baking treats. Our kids Grandparents have an older version of this farm at their home and the kids play with it for hours. It keeps them entertained. I wish they had this carriage when I was a little girl! Its so cool, fit for a real life princess. 9. Early Bird Barista Set by Fisher Price $22.84 + Free Shipping on orders of $25 or more. Aurora likes to "drink" coffee with me every morning. I thought it would be cute to get her a set to play with. How adorable is this wooden barista set?